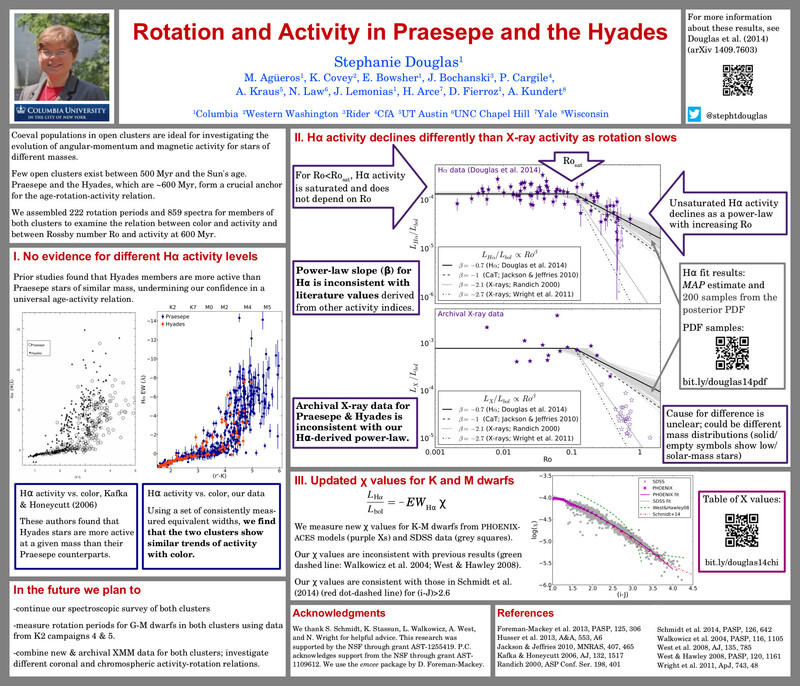 It's time for the 227th meeting of the American Astronomical Society! 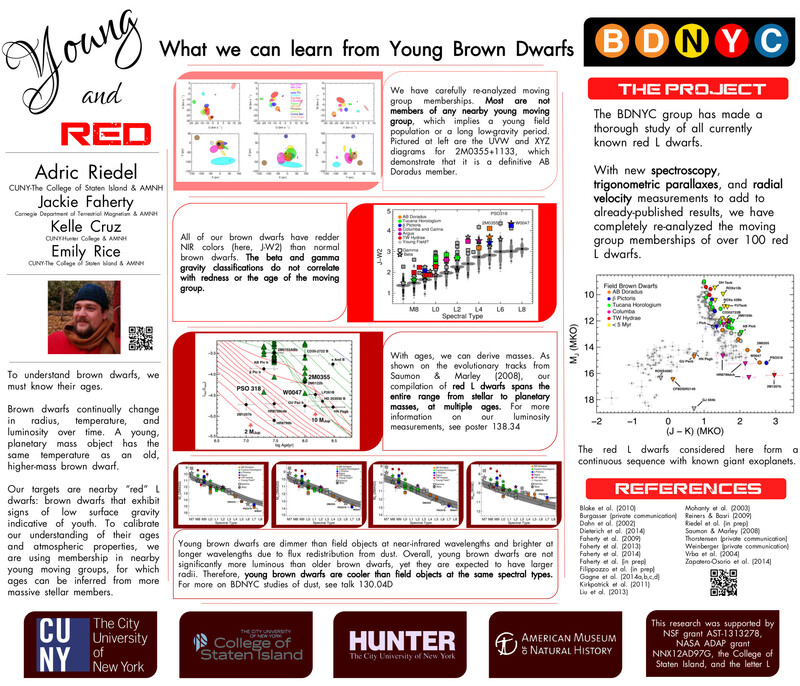 A number of BDNYC members are there to present talks and posters so be sure to check them out! In this post we list the times and dates various posters/talks so you can go check them. 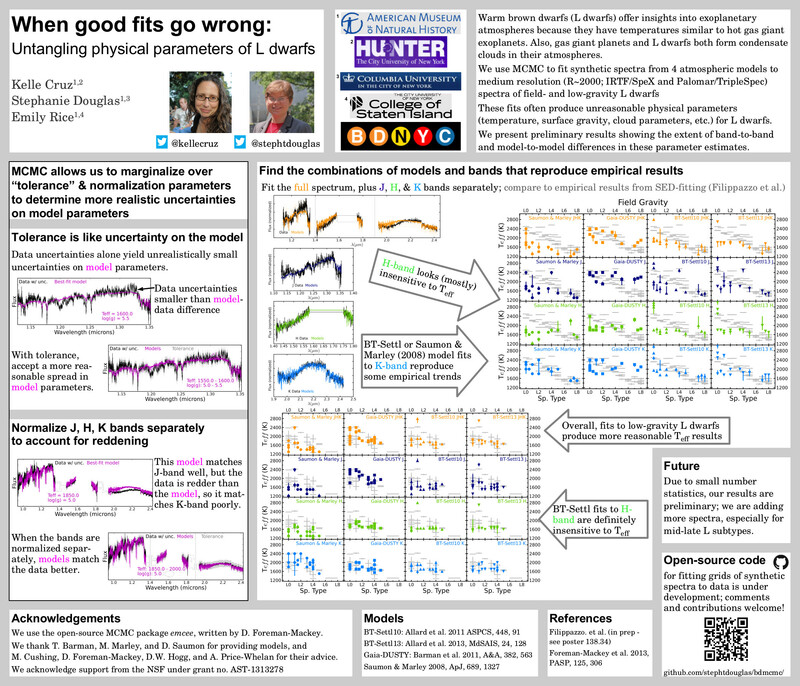 We'll be posting links to the posters as well once the conference is over. 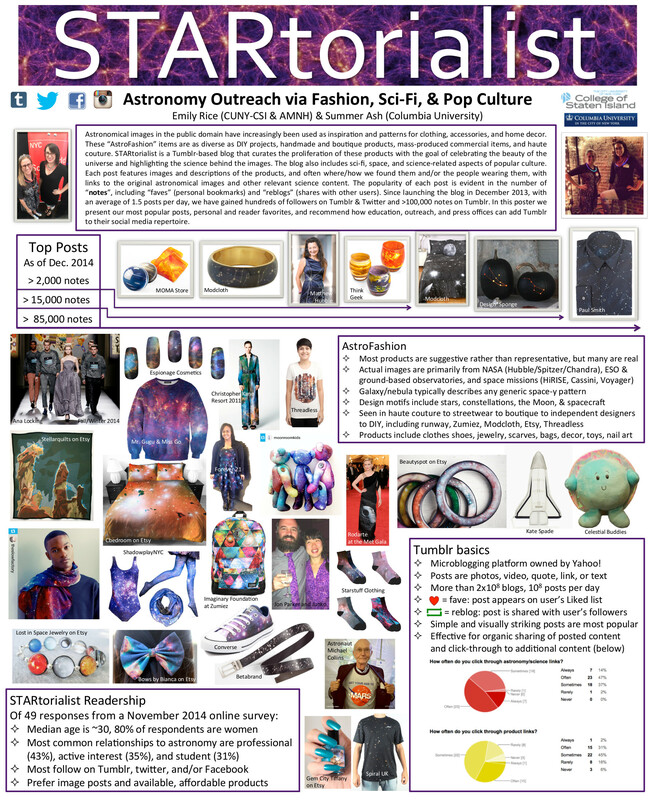 With this coming year, we are aiming to refocus the content in this blog. 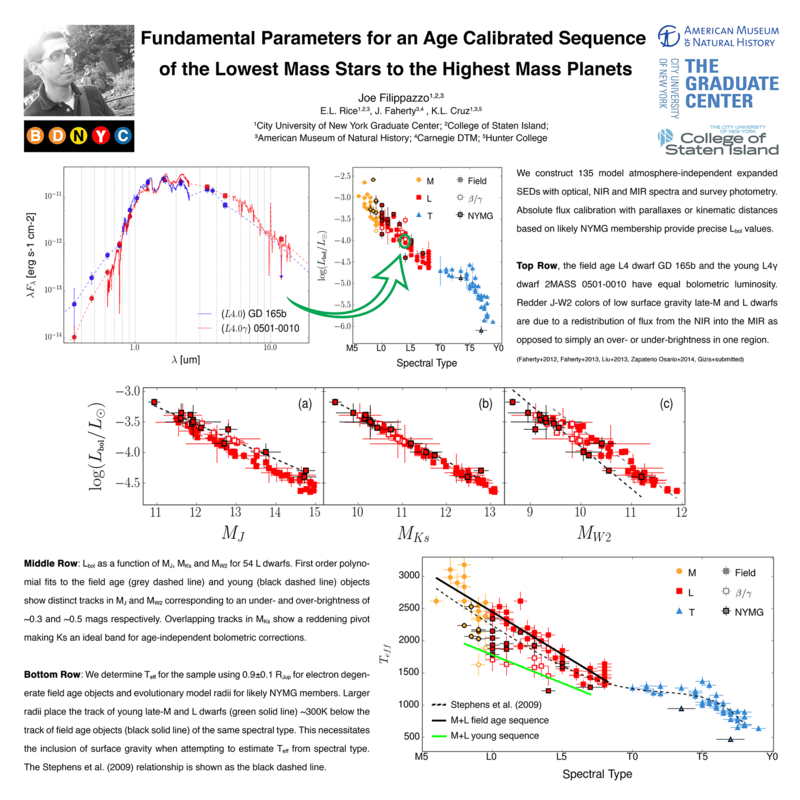 While this blog does include general purpose information about brown dwarf research, most of the content was geared towards internal descriptions of our software, our database, and our setup that are relevant only for members of BDNYC. We're now using Trac to manage the internal workings of our team and will be changing some of the content you see on these pages. From now on, you'll see posts describing general tips and tricks, including coding, project management techniques (such as using Trac), and observing tricks. You'll also see posts announcing team publications as well as team presence at conferences such as AAS. 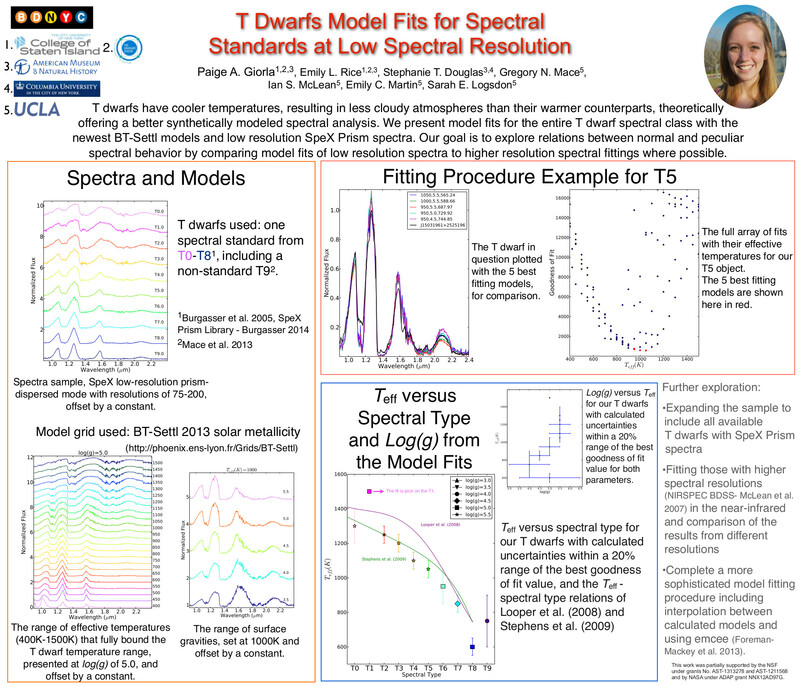 Finally, we hope to publish posts describing the small, incremental steps we take as we carry out our research, which include interesting results and plots. We hope these changes will result in more frequent posts and will make the blog more valuable to the community as a whole. This past September, four members of the BDNYC team travelled to Chile to observe at Las Campanas Observatories (LCO). This team was led by Jackie Faherty and included undergraduate students Munazza Alam, Sara Camnasio, and Haley Fica. Both Munazza and Sara were funded by National Geographic Young Explorers Grants. Las Campanas Observatories is one of the major telescope facilities in Chile, home to the two Magellan 6.5-meter telescopes and the soon-to-be-constructed Giant Magellan Telescope. For this observing run, the team had a single night on the du Pont 3-meter telescope and two nights on the Baade Magellan telescope. 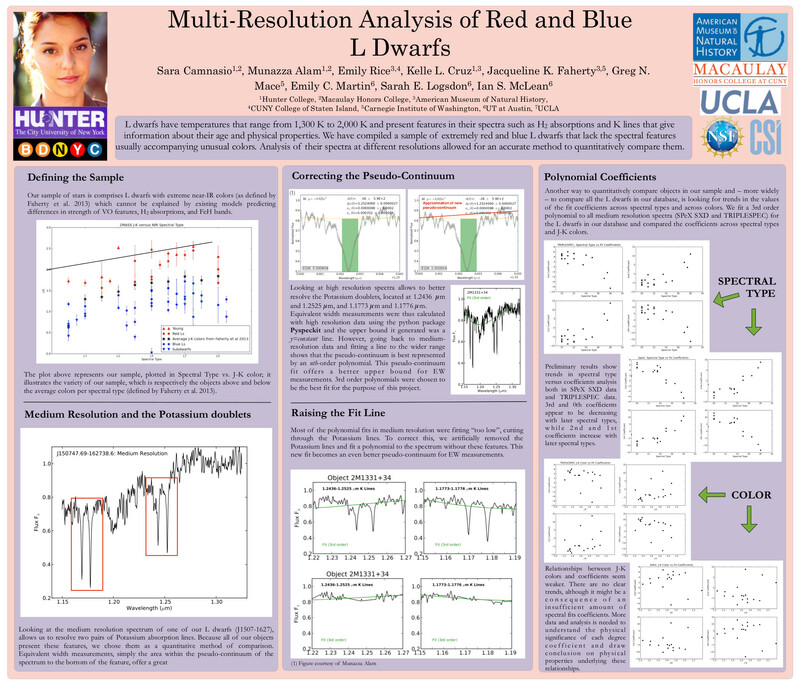 The aim of the run was observing cold brown dwarfs to obtain parallaxes with CAPSCam on the du Pont and FourStar on Baade as well as spectra with FIRE on Baade. While the weather did not cooperate throughout the run, with a mix of high humidity, high winds, and clouds, that did not deter the team from pushing forward and getting as much data as they could. 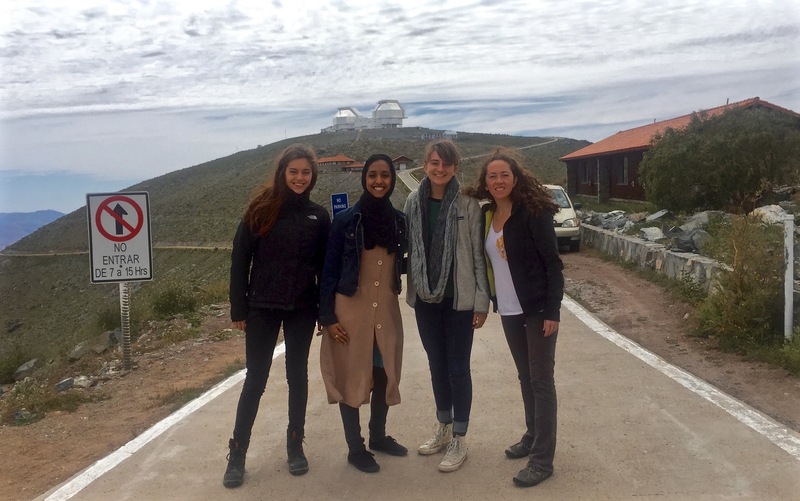 The all-ladies team has contributed to posts in the Las Campanas Belles blog, which details the adventures of women scientists at Las Campanas and other observatories. The below links direct to each student’s perspective and two summary posts. BDNYC (and friends) are out in force for the 225th meeting of the American Astronomical Society! 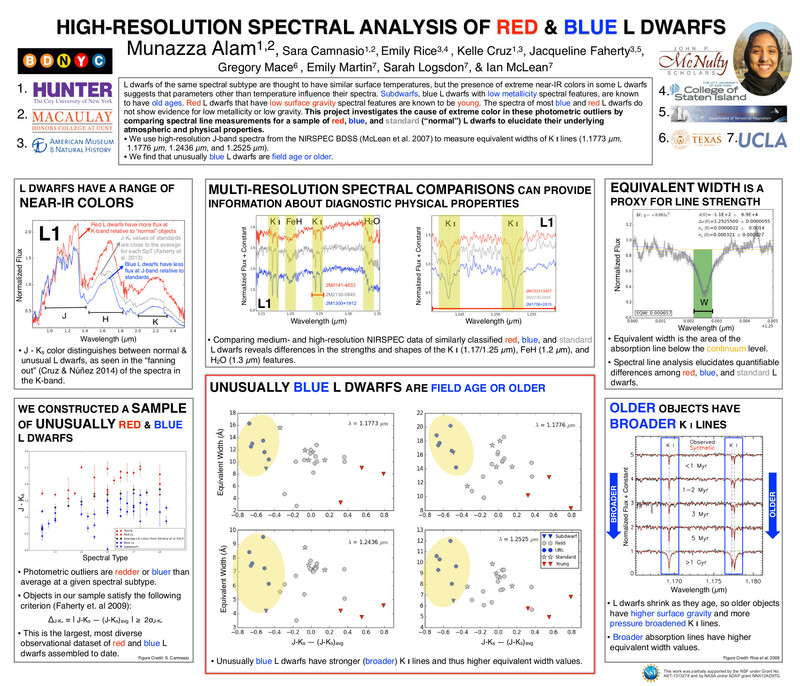 Can 3000 IR spectra unveil the connection between AGN and the interstellar medium of their host galaxies? We all love Google Docs. It's a functional and convenient way to share and collaboratively edit documents across platforms, time zones, and even continents. We in the BDNYC group use it extensively. But what if you want to write a scientific paper? Google Docs, as awesome as it is, is not much more than a word processor. We want the internal hyperlinks for sections, figures, tables, and citations, elegant mathematical formulae, well-formatted tables, more control over where and how our components are arranged - in a word, LaTeX. Yes, LaTeX has its own host of problems, but it's very good at what it does. There are a number of collaborative editing projects out there - Authorea springs to mind. But one of the simpler options out there is actually pretty good: WriteLaTeX. 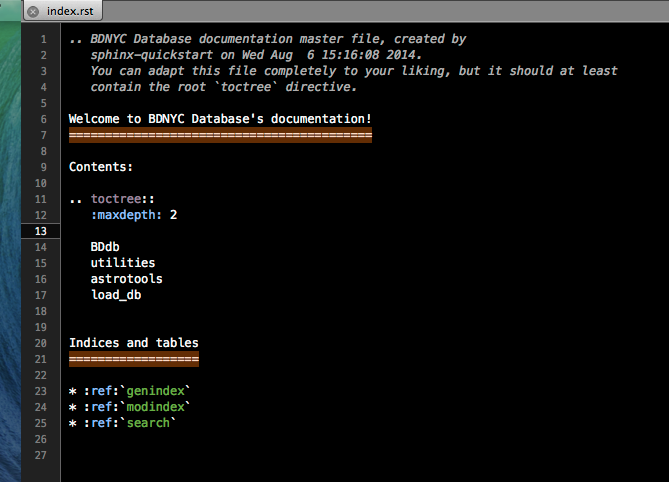 Sphinx is a free, online tool that helps generate documentation for primarily Python projects. We use it for HTML format outputs, but it also supports LaTeX, ePub, Texinfo, manual pages, and plain text formats. The markup language of Sphinx is reStructuredText (reST) (for documentation see http://sphinx-doc.org/rest.html). Of Sphinx's many features, the one most useful thus far is its auto-documentation of Python files, the steps of which this post details below. Read through the Sphinx documentation at http://sphinx-doc.org/. Run Sphinx's Getting Started function Sphinx-quickstart to quickly set up directories and configurations. NOTE: Since I have already completed this setup, it DOES NOT need to be run again for the BDNYC documentation. The Documentation folder contains the .rst and .py files that Sphinx uses to build documentation. Place any files for which documentation is to be made within that directory since Sphinx automatically looks there. The "maxdepth" function specifies the depth of nesting allowed. In order to keep the index clean and aesthetically simple, a maximum of one nested page is reasonable. In other files, however, highly nested pages are not only common, but well-supported by reST. For each item in the TOCtree of the index file, there must be a corresponding .rst file in the main directory for Sphinx to nest within the index HTML file. 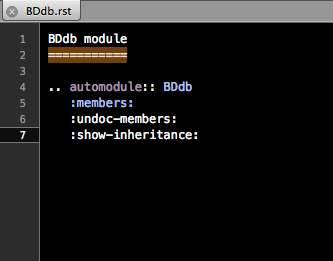 In the above example, a Database_instructions.rst file might contain in plain English how to interact with the database, while the BDdb.rst file contains the auto-documentation of BDdb.py. Open conf.py, which is the configuration file for Sphinx. It was produced during the "quickstart" function to allow easy modifications of aesthetic features (i.e., theme, font), and facilitate the HTML building process. Change the file path in line 21 to the applicable local copy. Comment out the file path of previous users in order to make it easier for others to update documentation. In order to make the HTML files, move Terminal to the directory of the documentation, i.e., '.../Dropbox/BDNYCdb/Documentation' and run make html. The make htmlfunction comes build-in through running "quickstart" and uses the makefile in the main directory. It can take other functions as well, including make clean, which deletes the entire contents of the "build" directory. Sphinx should put the generated HTML files in the /_build/html directory. To make the HTML files live on BDNYC.org/database, use the application Cyberduck, which can be downloaded at http://cyberduck.en.softonic.com/mac. Click "Open Connection" and put in the server, username, and password. Drag and drop any .rst and HTML files that were modified into the appropriate directory and the documentation should go live immediately!